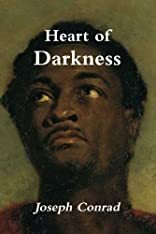 Joseph Conrad's 'Heart of Darkness' is widely regarded as one of the most significant works of English literature and part of the Western canon. The story was the inspiration for Francis Ford Coppola's 'Apocalypse Now'. This highly symbolic story is actually a story within a story, or frame narrative. It follows Marlow as he recounts, from dusk through to late night, his adventure into the Congo to a group of men aboard a ship anchored in the Thames Estuary. The story details an incident when Marlow, an Englishman, took a foreign assignment as a ferry-boat captain, employed by a Belgian trading company. Although the river is never specifically named, readers may assume it is the Congo River, in the Congo Free State, a private colony of King Leopold II. Marlow is employed to transport ivory downriver; however, his more pressing assignment is to return Kurtz, another ivory trader, to civilization in a cover up. Heart of Darkness is among my favorite works ever written. The story draws a reader in slowly until one is completely living in the world Conrad has created. It's an amazing work to experience as a reader and a great learning experience for a writer. I encourage everyone to read the story by candlelight. Try it and you'll understand why.